Maternal love faces formidable challenges in this stellar steampunk tale. In an alternate 1880s America, mad inventor Leviticus Blue is blamed for destroying Civil War–era Seattle. When Zeke Wilkes, Blue’s son, goes into the walled wreck of a city to clear his father’s name, Zeke’s mother, Briar Wilkes, follows him in an airship, determined to rescue her son from the toxic gas that turns people into zombies (called rotters and described in gut-churning detail). When Briar learns that Seattle still has a mad inventor, Dr. Minnericht, who eerily resembles her dead husband, a simple rescue quickly turns into a thrilling race to save Zeke from the man who may be his father. Intelligent, exceptionally well written and showcasing a phenomenal strong female protagonist who embodies the complexities inherent in motherhood, this yarn is a must-read for the discerning steampunk fan. 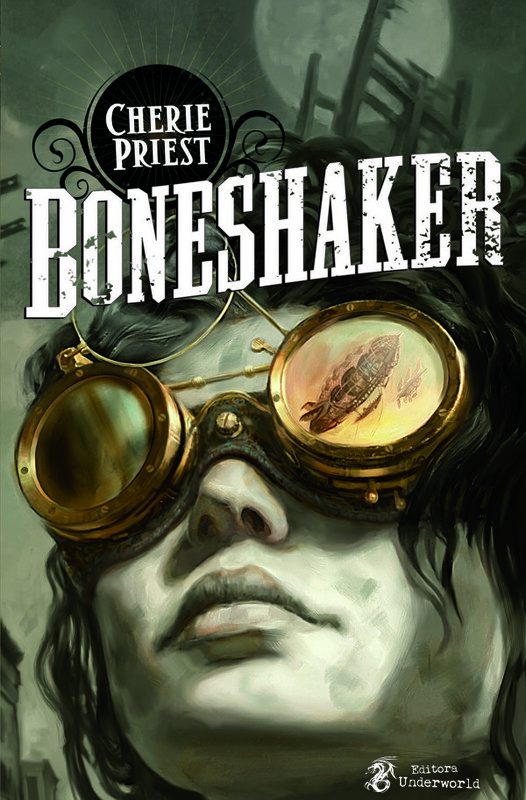 Boneshaker, da autora Cherie Priest, acaba de ganhar sua capa nacional. A publicação será feita pela Underworld, com data prevista para fevereiro. O livro se encaixa no gênero steampunk e, de acordo com a editora, abrirá espaço para mais publicações no mesmo estilo, como uma coletânia e o livro The Steampunk Bible.